Welcome to Grandpa Pete's Sunday Sauce - : The Worlds Best Tomato Sauce! 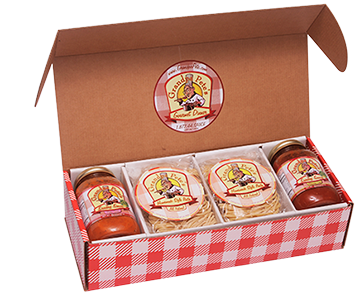 Try Grandpa Pete’s Sunday Sauce and bring the richness of Italian tradition to your family! For generations, the Serros have passed down old world family recipes and a passion for cooking. Grandpa Pete learned the secrets of great food from his mother and grandmother. It is now our pleasure to bring his special Sunday Sauces and Homemade Style Pasta from our dinner table to yours. All of our sauces are made with care and only the best all-natural ingredients. We want each of our customers to get a taste of Sicily in every bite!